Since our beginnings, renovating historic buildings has been a major focus of our work. 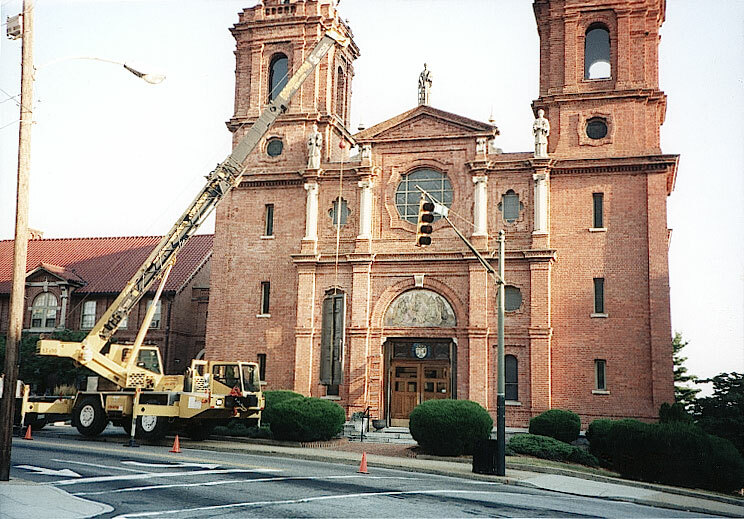 Over the past decades we have restored and renovated some of Asheville’s most important buildings. We can repair and restore windows and doors to be energy efficient and put them back into their original condition. When the original item is damaged beyond repair or is missing, we are able to duplicate the original woodworking, using the same materials and techniques as the original. We have have experience working with the National Register of Historic Places, the National Parks Service, The Asheville Historic Resources Commission, The Preservation Society of Asheville & Buncombe County. We have restored all kinds of houses and commercial buildings, small and large, we can rebuild one window or hundreds, from projects as varied as church doors to lighthouse windows. Removed replacement metal doors, and salvaged components of original doors. Duplicated two 10′ x 4′ oak doors utilizing salvaged profiles and photos of original doors. Both 400 pound doors were hung on reproduced hardware. Manufactured and installed reproduction trim, jamb and transom; installed stained glass. Repaired inner doors and double-acting hinges. Restored 20 doors and columns. Restored 10 double hung windows utilizing pyramid-lite design, restored hardware, and hung on original sash weights. Repaired 15 original doors and rejuvenated existing hardware. Repaired jams and re-installed doors. Submitted shop drawings to duplicate 11 Tower casements, and 6 Oil House double-hung windows based on 1871 construction documents and salvaged window parts. Submitted restoration hardware to match original. Installed original historic fabric into new windows where able. Manufactured reproduction windows with weather-wise hidden features; glazed, painted, and delivered to jobsite. Repaired 6 entry columns. Restored and re-glazed 40 original over-sized double-hung windows and hardware. Replaced sash cords and hung sashes on original sash weights. Rebuilt 20 original doors, 10 windows, and wood paneling for private client to comply with Historic Tax Credit Standards. Rejuvenated all hardware to original function. Submitted shop drawings and proposed hardware package for 13 reproduction windows based on details from salvaged original window. Installed original historic fabric into new windows where able. Manufactured reproduction windows with weather-wise hidden features; glazed, finishes shop applied, and delivered to job site. Engineered, manufactured, and installed sound doors using extant historic wood doors. 150 double-hung windows were repaired by epoxy consolidation and replacement of rotted parts with matching profiles. At all units – prime, re-glaze, and paint before reinstallation. All units re-hung with new sash cord on original weights. Restored 10 courtroom and 8 library windows; replicated original corner windows in courtroom. Stripped, repaired, and repainted 70 sanctuary casement windows. Cleaned, rejuvenated, and reinstalled original hardware. Site of the first indoor mall in America. Restored or re-built, 100 doors, and all original paneling and trim that was removed or damaged by previous owner. Re-hung all doors on new hardware. Replicated & installed trim and 5 new store front windows to match original. Removed, repaired, and re-hung 4 entry doors and 4 sliding freight doors. Repaired and re-installed all original hardware. Removed 470 interior and 60 exterior doors, rebuilt or duplicated 250 double- hung, 120 casement and 16 pivot windows. Rebuilt and reinstalled all to function with restored or reproduction hardware. Duplicated and installed running trim. Designed, manufactured, and installed 275 custom storm screens for selected casements and double-hung windows. Replaced 19 and restored 46 double and triple hung windows, jambs, and sills. Documented interior shutters. Restored 20 original double-hung windows and doors. Reproduced previously removed staircase based on photo documentation. Removed old aluminum store front windows and manufactured fixed, arched window units with design based on vintage photos of original building when it was a bank. Removed existing original double-hung window with diamond-shaped lite pattern and used as basis for duplication of window units. Manufactured and installed 2 reproduction windows with weather-wise hidden features. * The Griffin Award is presented annually by the Historic Preservation Society of Asheville and Buncombe County in recognition of outstanding contributions in Preservation.